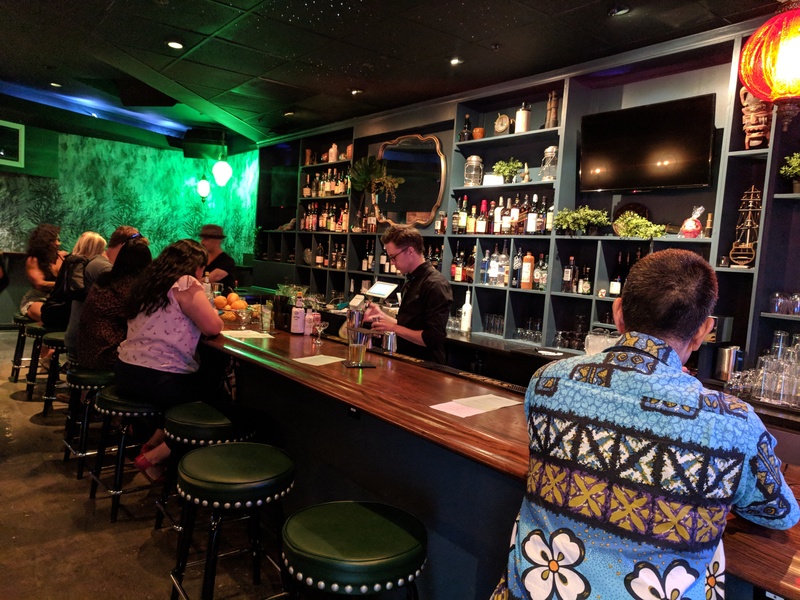 Little Tokyo has a friendly, new neighborhood bar with a fun, underwater theme and tropical drinks. It’s called The Mermaid, marked by a blue neon sign that invites locals to saunter on into the dark, but never dingy, dive. Last autumn, Arelene Roldan—a fourth-generation Angeleno who previously owned NoHo tap room Bar One—serendipitously met Milwaukee native Katie Kildow, who’s helped run Lemon Poppy Kitchen in Glassell Park for the past six years. Roldan had decided to close Bar One after a decade, but soon got the itch to open another bar. She posted as much to social media, which prompted a mutual friend to introduce her to Kildow. Kildow had bartended for twice as long as Lemon Poppy Kitchen had been open, and was actively hoping to get involved with a new venture that also served cocktails. Within a month Kildow and Roldan were in business together and in less than a year’s time, Mermaid was ready for its maiden voyage. Roldan tells We Like L.A. the duo chose the name after reading about the ama: Japanese women who free-dive for sea cucumbers, seaweed, shellfish, and abalone. The tradition dates back thousands of years, though the practice has dwindled in recent times. The pair always knew they wanted a comfortable, approachable neighborhood bar, and in that regard, the Mermiad succeeds. For a new bar, it has that timeless, always-been-there feel. Kitschy focal points include a vintage diving helmet near the entrance, a large plastic lizard resting on a shelf, custom seaweed wallpaper courtesy of Los Angeles-based Fourth Wall Design, and a porthole through which guests might spot a flirtatious mermaid or two. The illusion is a simple one crafted by a video screen positioned behind a porthole wall fixture. The mermaids come from an underwater burlesque troupe that regularly performs at Wreck Bar in Ft. Lauderdale. New design elements are on the way, including two art installations and other relics donated by friends, families, and regulars, as any locals joint is wont to collect over time. “If your grandparents had a wet bar in their basement, this is what it would look like,” Kildow said. Mermaid offers six rotating craft beer taps ($7), a small selection of wines ($9), and a list of classic and signature cocktails ($10-11). They include the Siren Song—essentially a dill gimlet—and The Pelican, made with tequila, house-made hibiscus syrup, lime, and angostura bitters. You can even get a boozy snow cone, the flavors of which change frequently. Mermaid worked with bartender Jessie Smyth to come up with a tropical, approachable menu. Food consists of shareable bar bites, but not burgers and fries. Instead, find braised brisket sliders and shrimp rolls on Hawaiian rolls; tater tots; nori guacamole, and hearts of palm or shrimp ceviche. You can also score “tropical” Chex Mix, made in-house and baked with coconut, brown sugar, butter, and pineapple. Late-night bites switch to meat and veggie dogs, popcorn, and chips ‘n queso, served via a concession stand. Stop by between 5 and 8 p.m. for daily happy hour, which includes $1 off beer and wine, $6 wells, and deals on food. They’re currently offer $1 wings for their grand opening, and intend to implement a daily punch bowl and daily classic cocktail soon. “I think a lot of places out here are a little high-priced, which is what the market bears, but we want to be that place where if you finally see an Old-Fashioned at a price you can afford, then you can start opening up your palate to new drinks,” Roldan said. As the Mermaid settles into its briny depths, the pair intend to start running karaoke, trivia, and music video nights, as well as Women Crush Wednesdays, which will pay homage to women within the bar industry. This could include guest bartenders, educational forums, meet-ups, or specials featuring spirits, wine, or beer made by women. 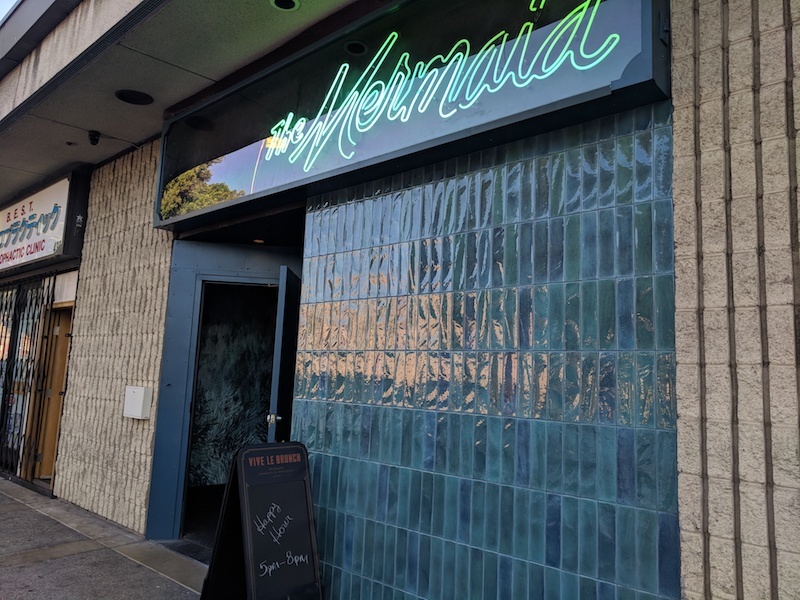 The Mermaid is located at 428 E. 2nd Street in Little Tokyo. Open daily, 5 p.m. to 2 a.m. Parking is $3 with validation, or free on Mondays or after 11 p.m. Or, you could take the Metro Gold Line and get off at the Little Tokyo/Arts District station.